Mario and Bobbery standing near the warp pipe leading to the Pit. 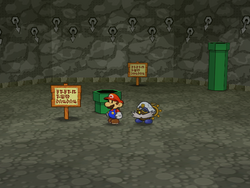 The Pit of 100 Trials of Rogueport appears in Paper Mario: The Thousand-Year Door. It is the first Pit of 100 Trials to appear in the Paper Mario series, with Super Paper Mario expanding on the concept by introducing two new Pits: The Flipside Pit of 100 Trials and the much more difficult Flopside Pit of 100 Trials. The pipe that leads down to the Rogueport Pit of 100 Trials is found near the entrance to the Palace of Shadow, which makes sense as, according to Grifty, the Shadow Queen created this dungeon and filled it with powerful monsters. She threw people she didn't like into the pit and left them to the mercy of the monsters down there. Sometime after her defeat, the pit was closed off from the public. The first few floors are very easy to clear, but as Mario progresses deeper into the pit the enemies become quite challenging. This is partially due to fact that Mario and his company get worn out by the relentless waves of enemies, but the adversaries themselves get stronger, culminating with the Shadow Queen's eldest pet dragon, Bonetail, inhabiting the final floor. Every tenth floor contains a brief rest from battles, a treasure chest, and a pipe to take Mario back to the surface should he choose to use it, but no Save Blocks or Heart Blocks can be found anywhere in the pit. Accordingly, Mario is recommended to carry many healing items for his trek, and should master guarding and superguarding techniques. Occasionally, Charlieton or a Mover can be found; Charlieton offers to sell Mario items for an unreasonably high price (though they can spell the difference between victory or grueling defeat), while Movers accept payment for taking Mario back up to the surface or skipping him down two or five levels, though it's possible with Mover to skip the levels with prizes. Two troubles at the Trouble Center require Mario to enter the Pit; Pine T. Jr.'s father needs to be rescued on Level 18, and another trouble necessitates the destruction of a wall on Level 50. Each floor has one enemy in the overworld, but when Mario enters battle, there are usually at least 2 enemies in the battle, with the deeper floors having more. There is no way to get down to the next floor without winning the battle, as the defeat of the enemies causes a Warp Pipe to appear out of the ground, leading to the next room of the pit. Spiny 3 3 3 Found wherever a Lakitu is located. Sky-Blue Spiny 6 6 4 Found wherever a Dark Lakitu is located. Amazy Dayzee 20 20 1 Appears randomly amongst the other enemies. One may appear on 92, 93, 96 or 97; two may appear on 94 or 98; they never appear on 91, 95 or 99. As Mario and his company advance down floor by floor, every floor will always have the same base enemy, but when they go into battle, the combination of enemies for the floor can vary. There are three possible combinations (with the exception of the 100th floor, on which the enemy is always the same). Below is the list of all the possible combinations of enemies that can be encountered on each floor. This is the Pit of 100 Trials. That pipe just seems to lead down forever... Still, the air seems kinda fresh here. I guess it's flowing down from above, huh? This is the Pit of 100 Trials, but I don't see any enemies in this room. At least there's a pipe to take us back to the entrance if you wanna bail. Then again, we'd have to fight our way back down to this level again... Better think it through before we do anything hasty, know what I mean? This is an intermediate floor in the Pit of 100 Trials. These appear every 10 floors. At least there's a pipe to take us back to the entrance if you wanna bail. Then again, we'd have to fight our way back down to this level again... Better think it through before we do anything hasty, know what I mean? This is the lowest floor in the Pit of 100 Trials. A zombified dragon named Bonetail used to protect this room. Yuuuuuck. Mario, I bet you're the first person to make it this far! I totally knew you'd do it! Now let's get out of this creepy place and back to the world above, OK? Mario and Bobbery on the lowest floor after defeating Bonetail. This page was last edited on March 11, 2019, at 21:09.